​ In this course, you will learn how to clarify your artistic intent—and also how to refine or define the unique dramatic structure of your story. You’ll learn to discover or sharpen the narrative voice, develop compelling characters and, if we have time, how to manage and incorporate research. Whatever you’re working on, whether it’s a historical drama, sci-fi thriller, or literary fiction, this class will help you discover (or re-discover) your novel’s most compelling shape and direction. Applegate Civic Center is located at 18014 Applegate Road in Applegate. Everyone carries secrets, but some are more precious and dangerous than others. What if your Spanish ancestors were not Catholic at all, but Secret Jews? What if the young boy, working alongside you in the California gold fields, is not a boy at all, but a woman on the run? At what cost are secrets kept? What are consequences of secrets revealed? Join Authors Robin Martinez Rice and Mary Volmer as they discuss how secrets – and the threat of revelation – drives their fiction and their research. The Applegate Civic Center is located at 18014 Applegate Road in Applegate. The tea is free, but space is limited. Email ApplegateFriends@gmail.com to make a reservation. For more information on the authors, visit maryvolmer.com and robinmartinezrice.com. Mary Mackey, New York Times Bestselling author of The Village of Bones, will discuss how she brings the Goddess-worshiping cultures of Prehistoric Europe to life by drawing on extensive archaeological research, the surviving art of the epoch, and her own imagination. Mackey’s novels take us on an epic journey to the past that has vital importance for the present. Novelist Mary Volmer will discuss research strategies that will help you unearth, organize, and effectively utilize historical information in any creative project. Learn the difference between static and living details, how to avoid superfluous detail, and how to use objects as windows into a character’s heart and mind. 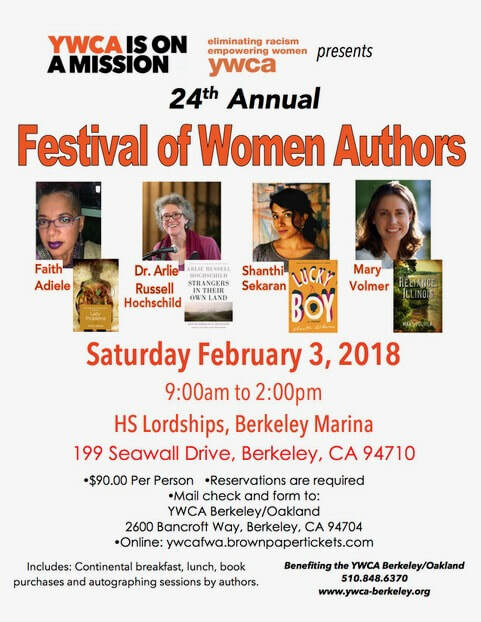 Join us for four authors and their stories. Includes continental breakfast, lunch, four speakers, book sales and autographing sessions. By Mail: Complete registration form (you can download brochure here) with a check made out to YWCA. Further instructions on brochure. Are you working on a novel but lost traction? Do you have a first draft but are not sure what's next? Having trouble knowing where to begin? In this one day intensive workshop, you will learn how to clarify your artistic intent and to refine (and in some cases define) the unique dramatic structure of your story. You will learn how to manage and incorporate research, historical and otherwise. You will leave with a clearer notion of how to attack the writing and/or revision process. for a lively discussion about writing, publishing and all things books. Tickets on sale in the library and at the door. Celebrate National Reading Group Month with bestselling authors Cara Black, Jessica Chiarella, Patricia V. Davis, Mary Mackey, and Mary Volmer. ​Moderated by Laurie R. King. Join me at the Livermore Public Library to kick off NaNoWriMo. May 14th, Reliance, Illinois BOOK LAUNCH!